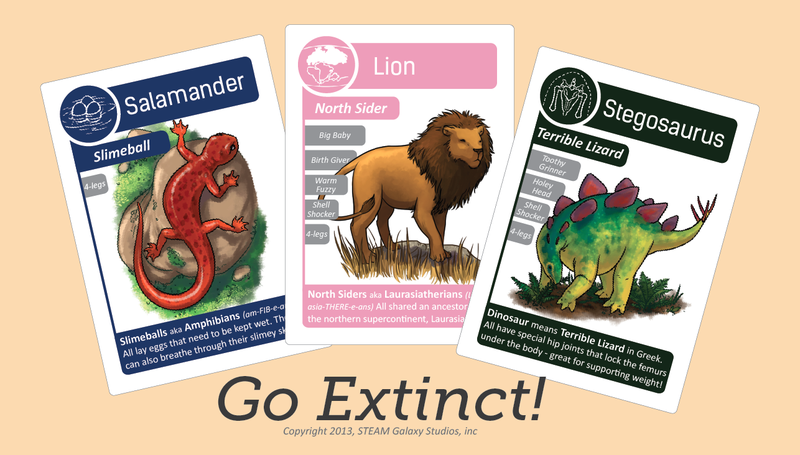 One of the projects I am involved in is creating an educational card game for kids called Go Extinct! Yes, its physical cards. The idea is that the game is similar to Go Fish, but instead of using regular playing cards, the cards are based on animals from the evolutionary tree. a) Players learn about different animal species, based on beautiful original artwork from illustrator Anita Tung. b) Players see how different animals are related on the evolutionary tree, with the common traits or environments that lead scientists to group species in close relation to each other. c) Players see a core concept in evolution, that trees are nested within trees (or, sets of sets)…and this concept is utilized in game play, as players can ask each other for cards at any level of the tree (thus trading off the likelihood of getting a match vs. the likelihood of getting exactly what they want)–this aspect also makes Go Extinct! more strategically complex than the standard Go Fish. I’m working with Ariel Marcy and Vanessa Kerr on finalizing this game. They will also be starting a studio, STEAM Galaxy Studios, Inc., with the vision of creating a story-driven universe with stories, games, apps, wearable tech, etc. that will emphasize STEM (science, technology, engineering, mathematics) and the arts (STEM + Arts). The belief is that creativity and the arts are an integral part of STEM, in terms of discovery, inspiration, innovation, and communication. Please check out the Kickstarter campaign and let others know about it!